Dig in to an array of artisanal sweet bites at the newly opened boutique cafe, The Gourmet Shop in Orchid Hotel, Balewadi. Very sophisticated and elegant, The Gourmet Shop has an instant old-school English vibe to it. The aroma of freshly-brewed coffee and delicately baked muffins will engulf you as you enter the place. 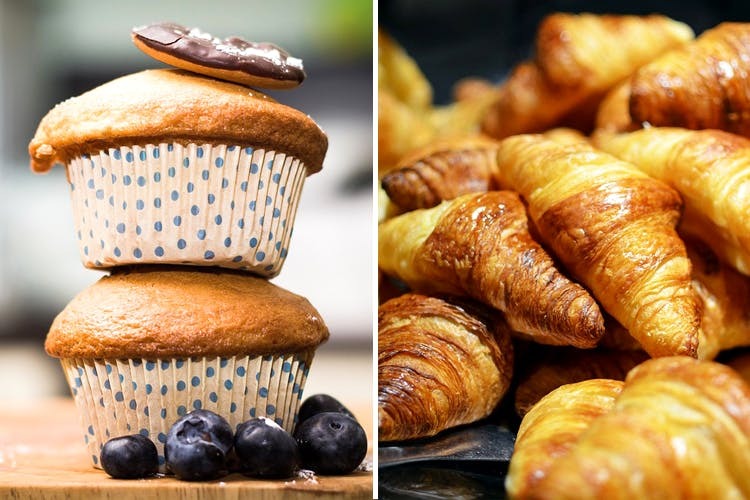 Start your day with a buttery croissant and blueberry muffin, priced at INR 150 each. If you want your dose of sugar to kick-start the morning, we recommend try the apple pie and peanut tart. Pastries by The Gourmet Shop deserve a special mention. We tried their brownie au chocolat for INR 180, and we think we fell head-over-heels in love with the dessert. It had the perfect balance of dark chocolate combined with butter and crunch of walnuts. Weight watchers, must try their high protein smoothie for INR 250. Packed with protein and a perfect balance of carbs and fats, this drink is available in five options – almond mocha, banana, chocolate, lemon and pineapple. Coffee addicts, there’s something for you too! Their cups of latte and machiato are to die for. Even though their delectable desserts and tarts were absolutely mindblowing, we would go out-of-the-way and recommend you pack their Focaccia Italian bread, made from olive oil, yeast, sugar and rosemary, for INR 200.